Chelsea stayed top of the Premier League with an impressive demolition job on Aston Villa at Stamford Bridge. The Blues were dominant throughout and Joe Cole drilled home the opener after running on to Frank Lampard's pass. Nicolas Anelka got the second when he finished off after Brad Friedel had kept out his first effort and an initial shot from Michael Ballack. 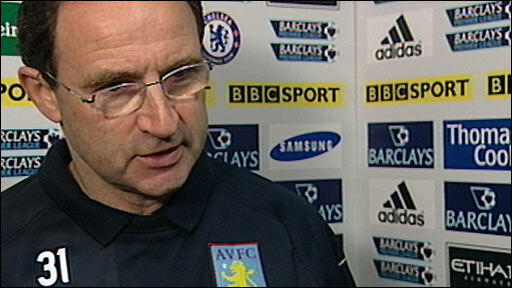 Anelka also hit the bar, while Villa failed to seriously test Chelsea goalkeeper Petr Cech. The performance made a mockery of pre-match suggestions that Villa could threaten Chelsea's 85-match unbeaten run at home. The final scoreline did not reflect the difference in the two teams and on the evidence of this display Chelsea, who were without several first-choice players, will be hard to stop this season. Villa went into the game with ideas of going top of the Premier League for the first time in nearly seven years. But within seven minutes of the game Villa keeper Friedel was given an indication of the sort of day he would be in for when he had to keep out a curling effort from Ballack and a Florent Malouda strike. Even by Chelsea's high standards at Stamford Bridge their first-half display was impressive. When they were not opening up Villa through the middle, their full-backs Jose Bosingwa and Ashley Cole were finding plenty of room to put in some dangerous crosses from the flanks. Villa had little answer to their precise passing and movement off the ball and when the visitors did manage to get possession they were soon hurried off the ball. Joe Cole and Lampard had both threatened to break the deadlock before the England team-mates combined for the opening goal. Villa gave the ball away on the edge of their area and the lively Malouda was straight on to it, feeding Lampard who, in turn, slipped a pass in for Cole to smash past Friedel. The goal failed to bring Villa to life, while Chelsea's hunger and confidence seemed to grow by the minute. The only surprise was it took another 20 minutes for a second, with Ashley Cole crossing and Friedel managing to push away efforts from Ballack and Anelka before the latter tapped in. Gabriel Agbonlahor drove in a shot before the break, but they will have ended the half thankful that they were not already out of the game. After the restart Stiliyan Petrov shot past the post and Agbonlahor almost picked out his unmarked strike partner John Carew after John Terry was caught dithering. A goal for Villa would have made matters interesting, but Chelsea continued to look the much more likely scorers. Ballack, Lampard and substitutes Salomon Kalou and Franco Di Santo all had their chances to ram home their superiority without being able to finish or finding Friedel in fine form. Chelsea manager Luiz Felipe Scolari must have enjoyed seeing his side play with such freedom, despite his seemingly agitated state on the sidelines. On a day when little went wrong for his side, the biggest worry for Scolari - and concerned spectator England coach Fabio Capello - will have been the sight of Joe Cole limping off in the second half. 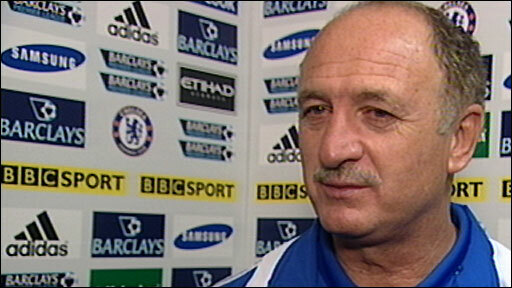 "In the circumstances it's the best performance this season, with four or five players out. "We played a fantastic game in the first 45 minutes. We have had some injuries this week and the players played very well. It puts us in first place and we have 15 days to recover. "It's a big game and the three points are very important. We need to win more games at home." "We're learning all the time but that was a harsh lesson. We need to regroup and start again when they return from international duty. "We want to be up there with the top four sides, otherwise what's the point? "They played exceptionally well and we didn't. We can play much better. From start to finish they were strong and comfortable on the ball. We have a good distance to go to compete on a regular basis with those sides." Chelsea: Cech, Bosingwa, Ivanovic, Terry, Ashley Cole, Mikel, Joe Cole (Kalou 57), Ballack, Lampard, Malouda (Belletti 83), Anelka (Di Santo 46). Subs Not Used: Hilario, Bridge, Ferreira, Mancienne. Goals: Joe Cole 21, Anelka 44. Aston Villa: Friedel, Luke Young (Milner 46), Davies (Cuellar 46), Laursen, Shorey, Reo-Coker, Petrov, Barry, Ashley Young, Carew (Harewood 71), Agbonlahor. Subs Not Used: Guzan, Knight, Salifou, Gardner. BBC Sport Player Rater man of the match: Chelsea's Frank Lampard (7.66 on 90 minutes).